After feeling paralysed about doing any sewing due to the ridiculously large garment sewing queue in my head, and choosing to ignore this feeling by reading in the evenings for several weeks instead, I finally settled on Marfy 3408 to kick things off. Of course, that was many, many weeks (months?) ago now… I’ve been sidelined by a big project at work, which has just about finished. If you own the 2014/2015 catalogue, this came as one of the free patterns. You can also buy it online as a PDF here. This pattern gave me many surprises – pretty much all of them good. The gentle shaping in virtually all of the vertical seams really adds up to a beautiful outcome and is the kind of thing I’ve come to expect from a Marfy. The pentagon panel at the front provides shaping – and the almost bateau-neckline is lovely. I was concerned that this pattern style would be a little matronly on me – almost ageing? 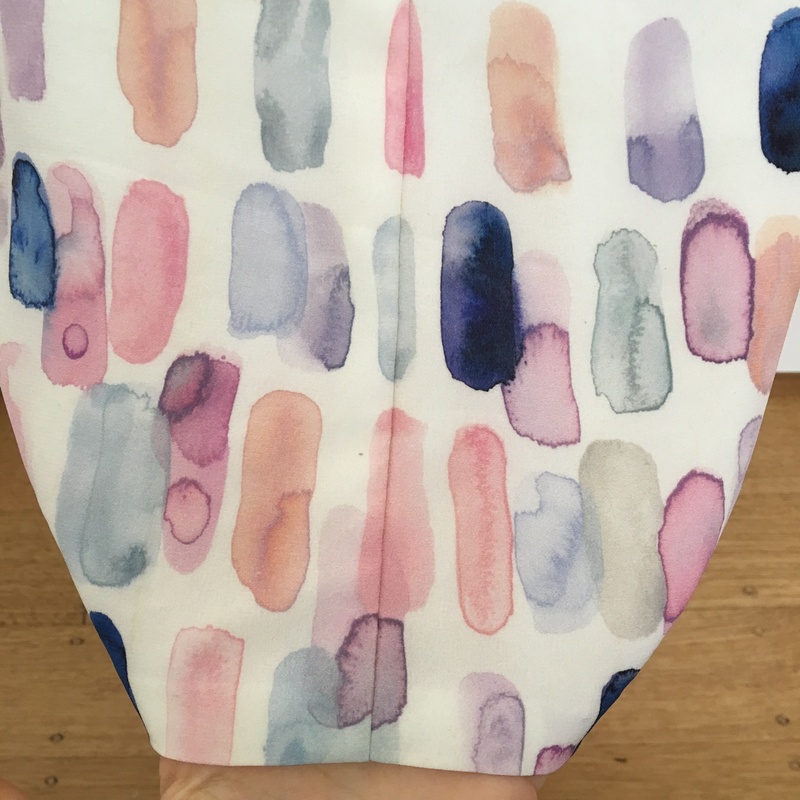 I wanted to sew this up in a Crepe de Chine – how is it that I do not own more of this fabric type?!?! Criminal. It came from China, but looked exactly as it was pictured, and was decently weighted but not opaque (so I chose to underline it with white CDC). Prewashing it indicated that the colours were reasonably fast (I use this silk wash to handwash all my silk things – dry cleaning is the worst! I’m not a huge fan of the essential oil blend they use to scent it, but it’s at not overly affronting to the senses and the wash does do a good job) – having the colours run was what I was most worried about! It is the first time I have tried a different size – a 48 – as opposed to my usual 46. I ended up using the 48 across my shoulders and shaping down to a 46 under the bust. From wearing a Marfy blouse I’d made previously – 3449 – I’d thought it a smidge too tight and wanted to try the next size up. I’ve typically given fitted woven tops a wide berth as I like a svelte fit but can’t abide not being able to move my shoulders/arms comfortably throughout the day. We’re all so used to the freedom of knit tops, aren’t we? 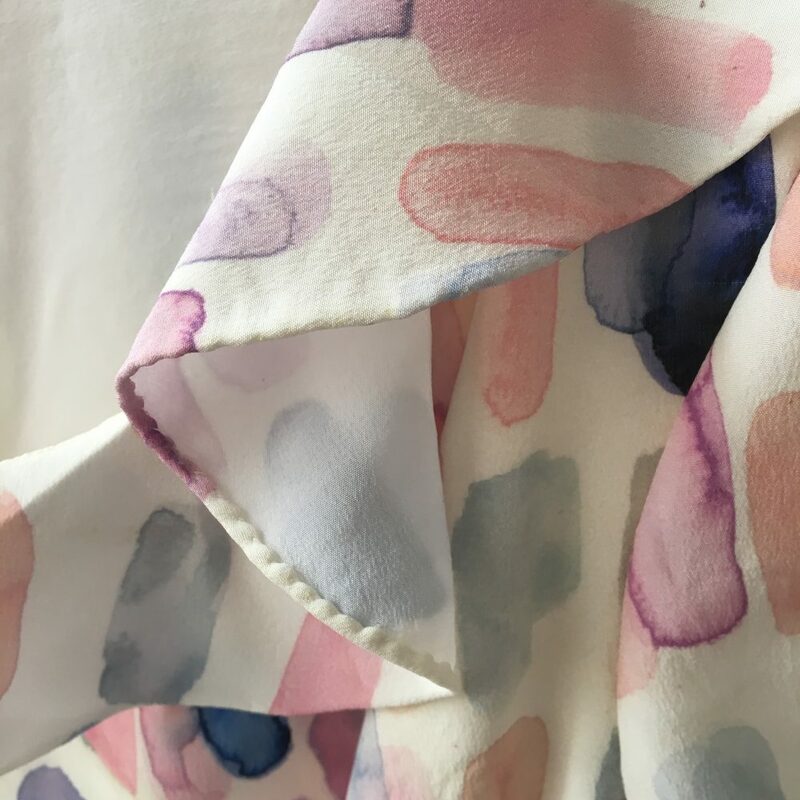 I had presumed from the stylised drawing that the flounce ends would be sewn into the centre front V shape – but they are ever so slightly longer than the seam here so are obviously designed to roam free. I did join them at the shoulder seam however – the seam lengths matched perfectly here. I also chose to underline the flounces – else they would have been visually marred with the pattern underneath peeking through. This presented a challenge to finishing the seam edges- in the end I took the risk to do a hand-rolled hem. You could say it was a roaring success – beautiful little stitches hidden underneath and not visible from the front thanks to the underlining. But having two layers of fabric rolled up in this tiny space does make the edge quite bouyant – and I couldn’t be sure if this would be too much until it was all sewn up. I think in the end I think it acts a bit like a miniature version of horse hair braiding – it keeps the flounce’s natural curve well balanced and structured. I little less floppy than had it been just a single layer of CDC. I like it. Sewing friends thought it would look less age-ing if I shortened the sleeves to be capped – As the pattern is they fall a few cm above my inner elbow. I tried shortening one sleeve during the muslin phase and found myself still leaning towards longer. I ended up getting away entirely without a zip – I can pull this over my head quite easily. Very happy with that outcome. 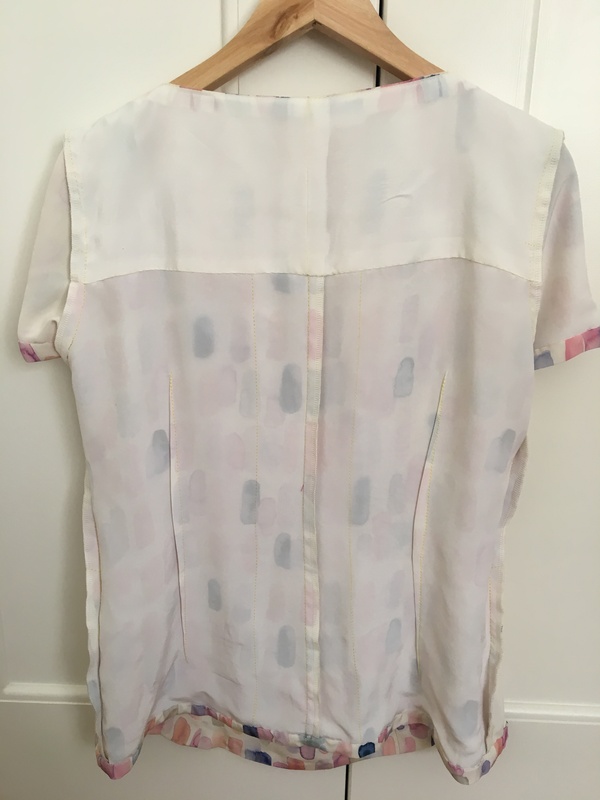 I chose to draft some facings to hide the connections and cut seam allowances on the inside of the blouse – however I ran out of CDC (the last of the stuff I bought from Susan when I was in Baltimore back in 2013!) halfway through. I bought more, but of course it’s a slightly different shade. oops. 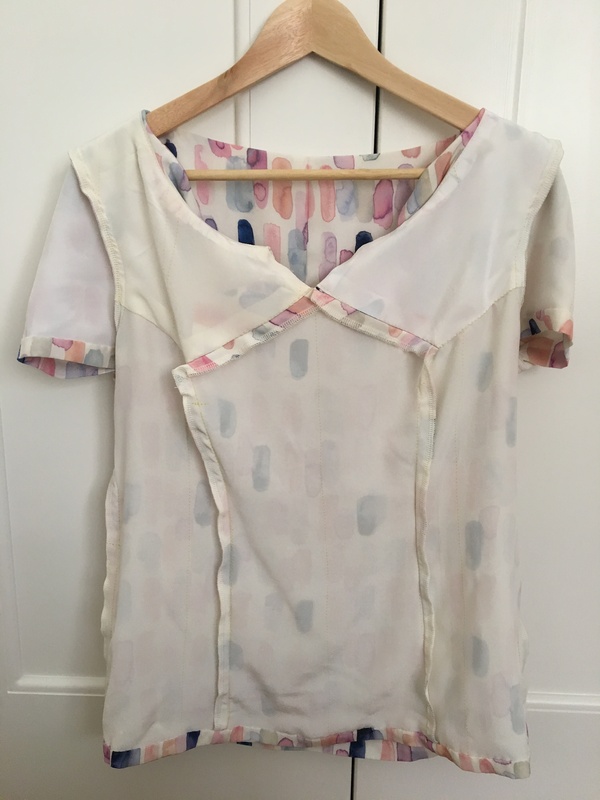 Oh yes – I did just recently acquire an overlocker! This was my first project using that machine. It’s not what I’d usually prefer to do for seam finishes – but these days time is hard to come by. So all the edges here are overlocked. The princess seam doesn’t sit the best across my bust as a result, but it was either that or not have a new top to wear! The overall feeling for this blouse is that it’s a winner – I absolutely adore the fabric, it matches with both my corporate and casual wardrobe (I’ve already worn it to both) and I can even chase my daughter around the park and pick her up without worrying about the shoulder seams being too tight. So I’m very happy with this make! Forgot to say your blouse is gorgeous! 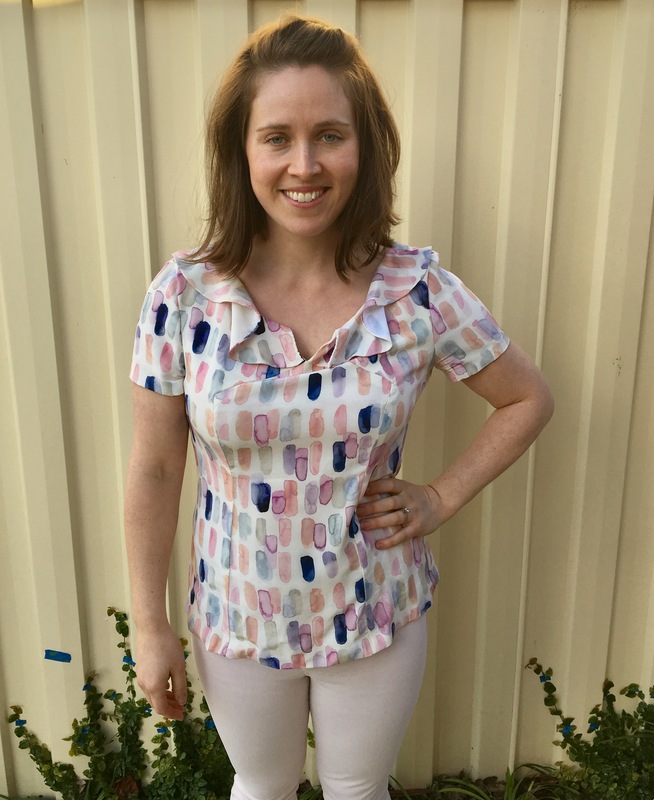 Beautiful blouse – love the fabric and the fit. Well done. What is CDC, for those ofus on the other side of the globe? very pretty. 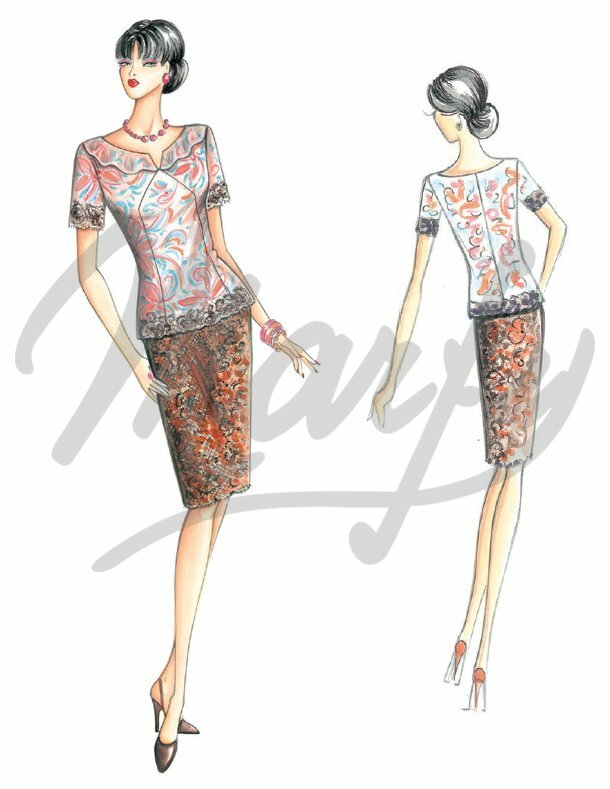 You are so right about Marfy, their design and the shaping in their patterns is second to none. I love the fabric and pattern. Your daughter is beautiful! Definitely a beautiful fabric and you have done a fine job with it, inside and out! Just gorgeous. I love the seam lines on the pattern. Your fabric is beautiful, as are those tiny stitches on the hand rolled flounce hems. I have never even tried hand rolling a hem, so I am in awe. Beautiful work. Thanks Katherine, the seam lines on this one are pretty cool. 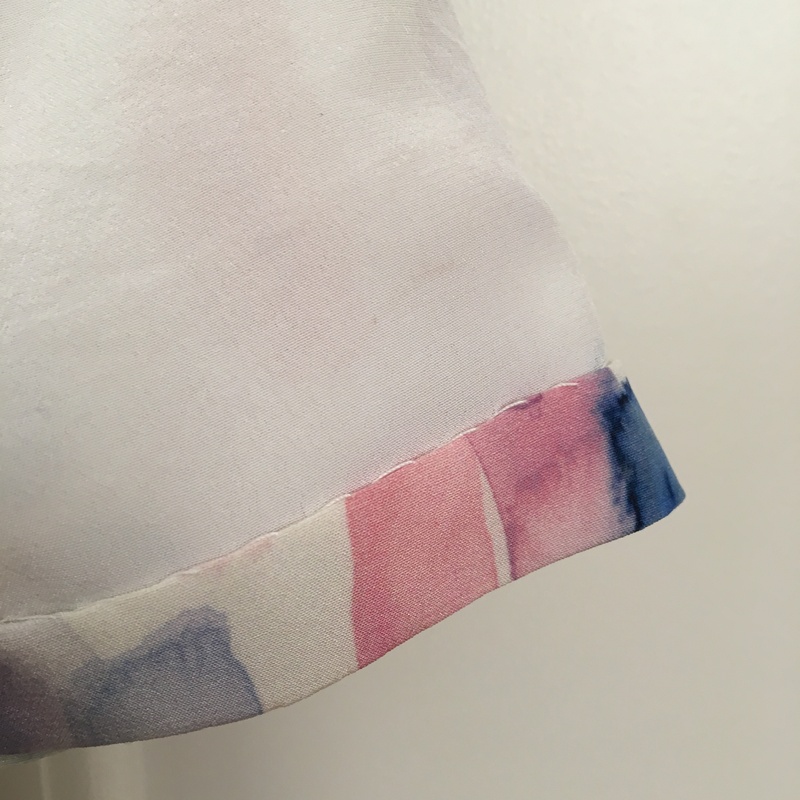 And I’m a little addicted to hand rolled hems – they’re surprisingly easy once you get the stitch direction down pat (and there is no shortage of youtube videos to help on that front) and pretty quick to stitch up as well. Going around a corner is a bit of a challenge! a beautiful blouse! 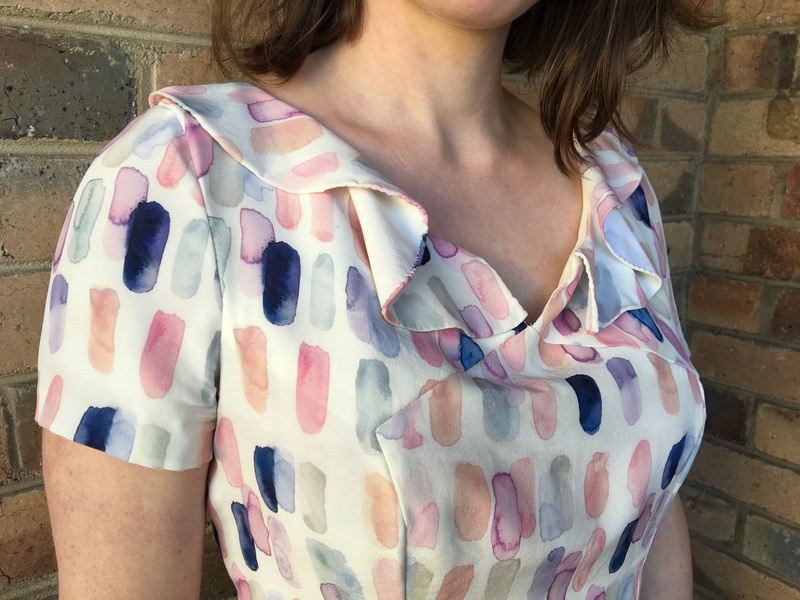 I was in fact getting matronly vibes looking at the patterns picture, but it’s turned out really very fetching irl! Oh, glad I’m not the only one! I was worried, especially as my muslin didn’t do much to dispel those thoughts… I figured (hoped!) that the floaty silk would save it, and I’m pretty happy with how it did. Thank you! You look fabulous in this pretty blouse. And it does not look matronly at all! Thanks Tomasa :) I’m glad you don’t think so! Hi! 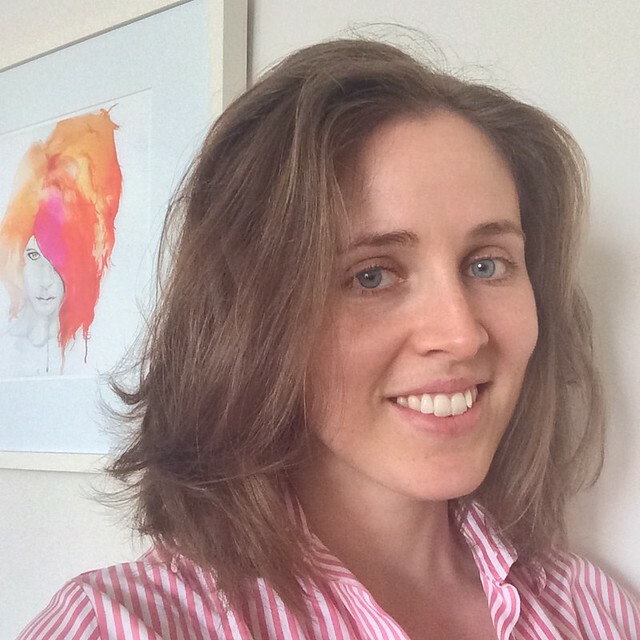 New blog follower here! I love this blouse! This is so so gorgeous! I would have thought the front flounce sewed into the notch too, going by their illustration. Gosh I love that print! Thanks Amanda! The arm movement range on this one is stellar! So lovely, and such a great fit on you! Beautiful rolled hem on that flounce! And how exciting about the overlocker, so awesome for knits! Except that I never sew knits haha! The plan was to start, but I have maybe 3 knits in my stash. Good excuse to go fabric shopping, huh? The flounce is very en-vogue at present The colours in the fabric look lovely on you. Great fit too. Well done! Thanks Carol – you know, that’s a great idea – this would work probably even better in a lightweight merino – and it would be super cosy! I might have to go fabric shopping! That is just lovely. I appreciate your point about the rolled hem with 2 layers of fabric. 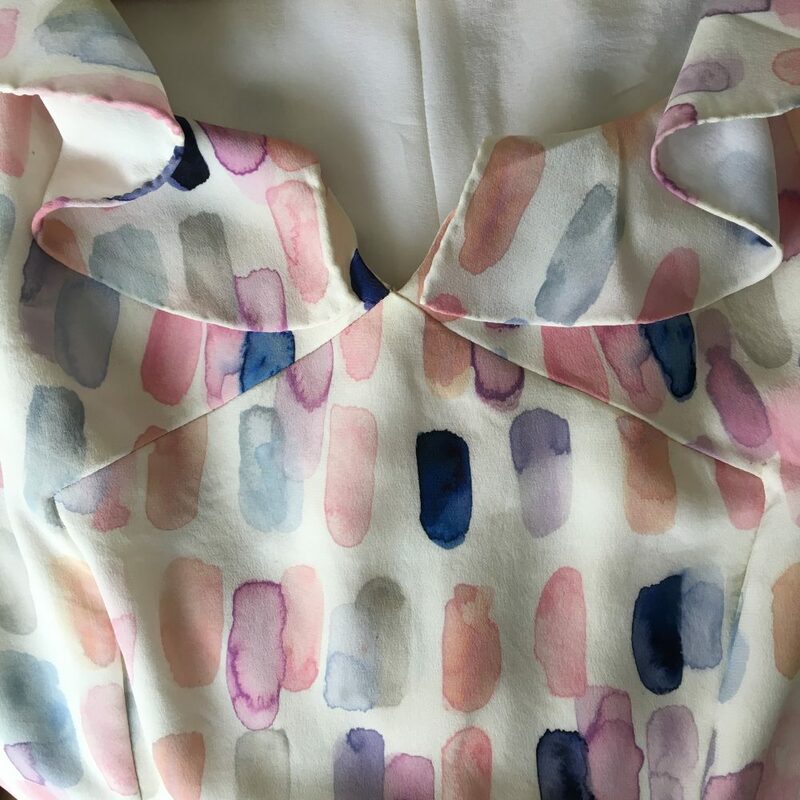 I’m always wary about Marfy patterns as real live humans look nothing like the drawings but you’ve made this top your own – lovely., more than lovely……. Love the fabric so much! It goes great with this design too, and it doesn’t make you look older at all. Such a nice new top! 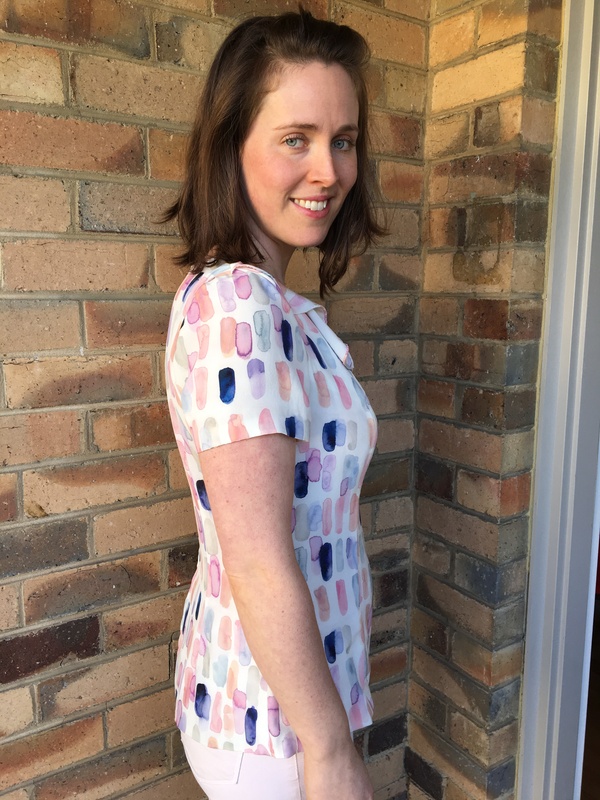 Thanks Kelly – it certainly is fabulous fabric, I’m very much in love with it! Absolutely adore the fabric you used! What a great blouse, I love the unusual seamlines. Always fun to see Marfy patterns sewn up! Thanks Lisa – couldn’t agree more either, I always get excited when I see a Marfy pattern sewn up! 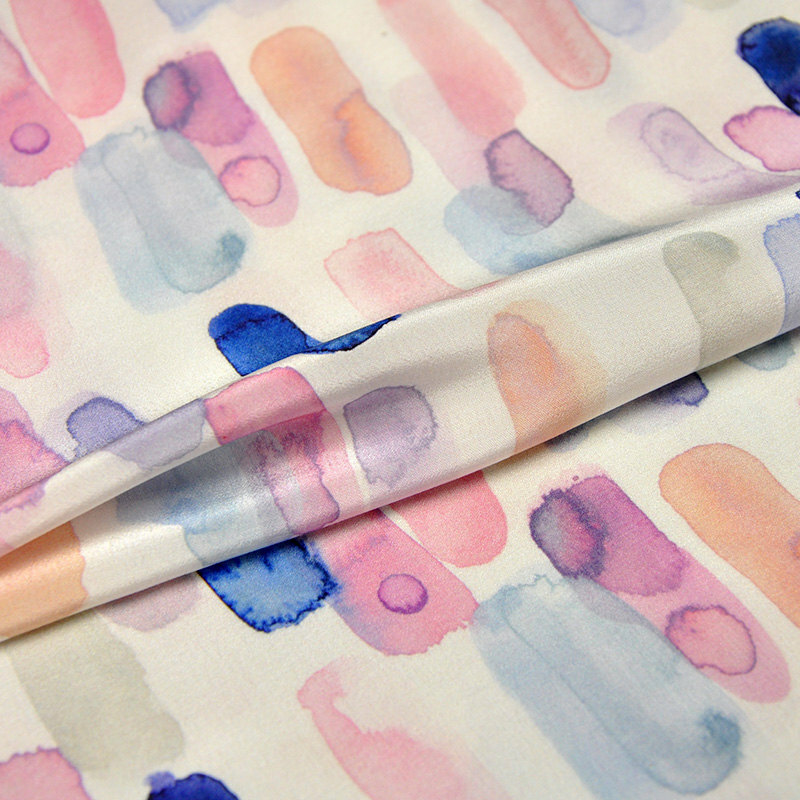 I’m in agreement with others that this fabric is amazing. Such a pretty and interesting print. Marfy patterns are fun as they always seem to add great details. Enjoy this and maybe there are variations in the works? This is so pretty – I love the fabric choice, and your alterations work really well.